From the moment you arrive at Kirroughtree Country House Hotel, you will begin to feel the cares of the outside world melt away. Read The Good Hotel Guide reviewOne of our friendly staff will be there to welcome you personally to the hotel and show you to your luxurious room. Kirroughtree is an ideal retreat from modern life, with its elegant public rooms, spacious and comfortable bedrooms, and excellent food. The oak paneled lounge has been sympathetically restored with beautiful oil paintings adorning the walls, opulent drapes and sumptuous sofas and armchairs. In addition, morning coffee and afternoon tea can also be taken in the Major's Lounge, named after Major Armitage. The comfortable lounges are the perfect place to enjoy pre dinner drinks and mouthwatering canapes, whilst browsing over the evening's menu. After your meal, savour a fine cognac or liqueur, coffee and petit fours over conversation or perhaps a game of bagatelle with fellow guests. Relax on the terrace on a sunny day with a glass of chilled wine and enjoy the spectacular views. Perhaps a game of croquet, or practice your short game on the pitch and putt lawn. 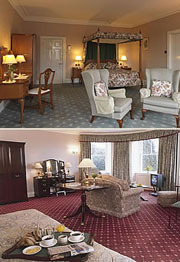 The 17 bedrooms and suites range from the Regal Suite, originally built in 1890 as the library wing, through deluxe to standard rooms and boast panoramic views over the grounds and ancient forest down to the River Cree which meanders towards the sands of Wigtown Bay. All rooms are spacious, with a generous sitting area, and easy chairs and table. Fresh fruit and sherry await your arrival, as well as tea and coffee. There is satellite TV for your entertainment, while each bathroom is luxuriously furnished with fluffy bathrobes and towels. For guests with dogs, the lower ground rooms are ideal, each with easy access to the grounds.